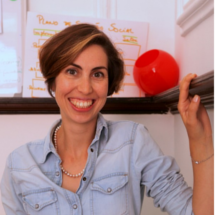 Co-founder of the company, Clara Rodrigues is graduated in Educational Sciences and has a post-graduation in Social Economy (University of Coimbra). In Future Balloons she works in the innovation and human resources areas. Her areas of expertise: applications, project conception and implementation; development of partnerships; external evaluation; consultancy using design thinking, co-creation and user-centered innovation. She is a sweet tooth, loves chocolate and ice cream.